Riga, a capital city that many have never heard of. Latvia, a country that many people can’t place on a map. And yet there are so many things to do in Riga and so many reasons why Riga should be your next city break! 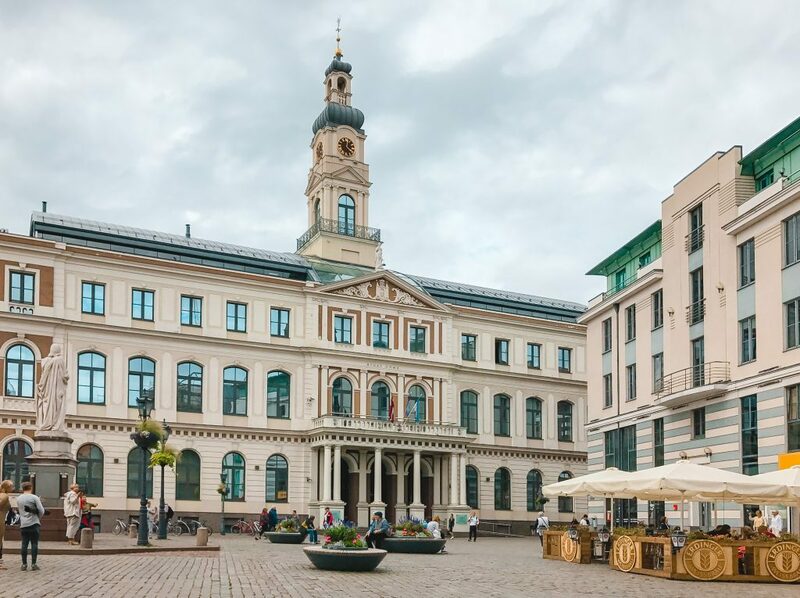 I travelled to Riga in collaboration with airBaltic to find out exactly why you should visit the small Baltic city – believe me, it’s definitely worth a visit! Disclaimer: My flights to and from Riga were sponsored by airBaltic. However, as always, all opinions are my own (and probably weird and wacky and a little odd, as normal). If you have ever looked at my Instagram page, then you’re probably well aware that beautiful cities with charming streets and incredible architecture are my jam. You know where has lots of those? Riga. You can barely walk three steps without being confronted by beautiful facades, towering churches, and cobbled streets. That’s my kind of confrontation, thank you very much. 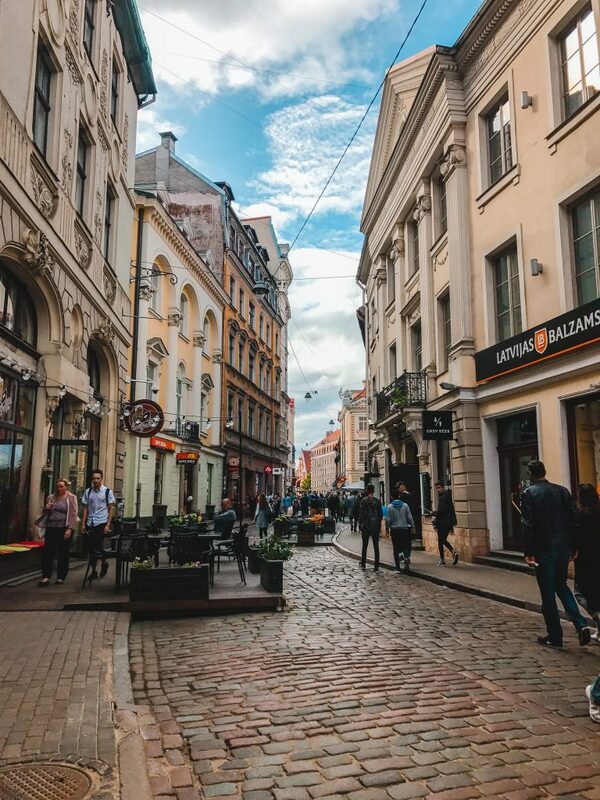 Walking the streets of Riga’s Old Town almost feels like you’ve stepped back in time, to an era with fewer worries, no cars and a higher likelihood of falling over cobblestones. 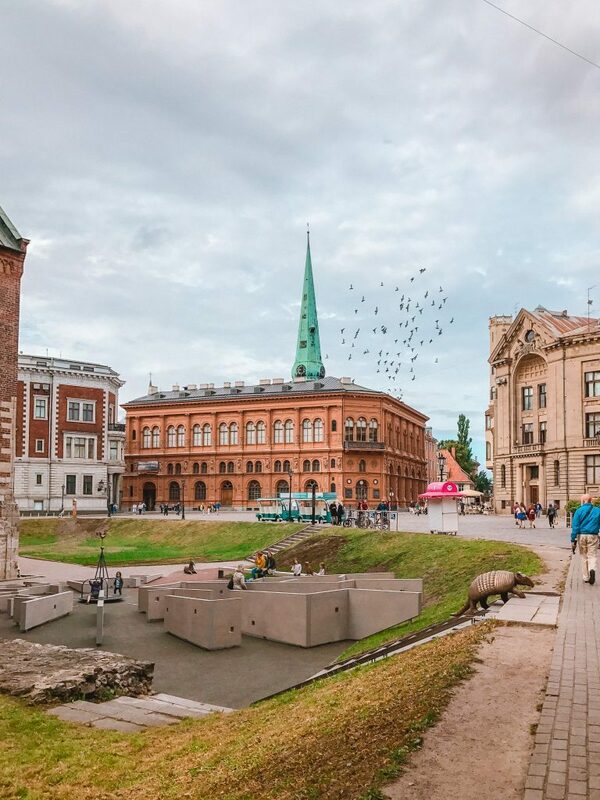 From the imposing St Peter’s Church, offering views over the entire city from the panorama platform, to the Renaissance style House of Blackheads, or from the symbolic Freedom Monument to the red brick cathedral standing proud in Dome Square, everywhere you turn in Riga will have you snapping Instagram-worthy photos. Little known to people not from the Baltic States, Latvia actually has two independence days (like Lithuania, in fact). In the last 100 years alone, Latvia has declared independence three times, twice from Russia and once from (Nazi) Germany. The best place to visit if you want to learn more is the Occupation Museum, which I would actually highly recommend for anyone with the remotest interest in learning the history of the country. Riga gains immense bonus points for still having so much to do when it rains, including more museums (such as the Museum of the History of Riga and Navigation, which is one of the oldest museums in Europe), the Powder Tower (which also houses a museum, the Latvian War Museum), the Nativity of Christ Cathedral (the largest Orthodox Church in the city and a colourful pink) and also the Central Market, located in massive converted Zeppelin hangars. If you fancy a spot of sightseeing without the walking, try the Riga Hop On & Hop Off bus tour! The Occupation Museum is located in the Town Hall Square – here you can see the Town Hall itself. I mean, it’s not a blog post from me if I don’t wax lyrical about their food at least once, right? Just like Lithuania, Latvia has a love of carbs. You can get normal pancakes or potato pancakes, rye bread is pretty much a staple and potatoes seem to turn up everywhere. 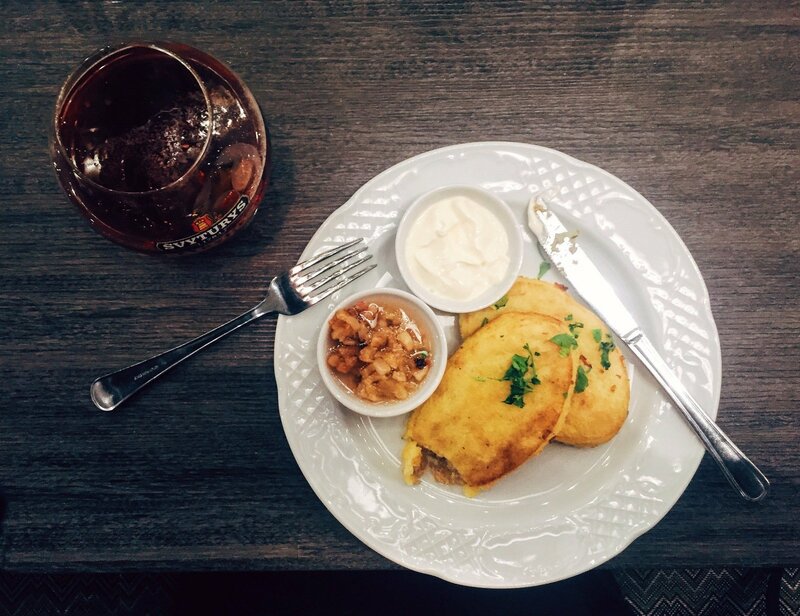 The food in Riga reflects its history as a port city and fish is in many meals, including potato pancakes with lightly salted salmon (my favourite), as well as dishes with the slightly less common catfish and red mullet. Pro tip: Fly business class with airBaltic and experience incredible Latvian gastronomy high in the sky – from beef rolls with boletus mushrooms to fried red mullet with spinach risotto, there is sure to be a dish to please even the pickiest eater. After all, I had never tried red mullet and I don’t particularly like spinach but after eating the fish course on my flight to Hamburg – wow! I wanted seconds! 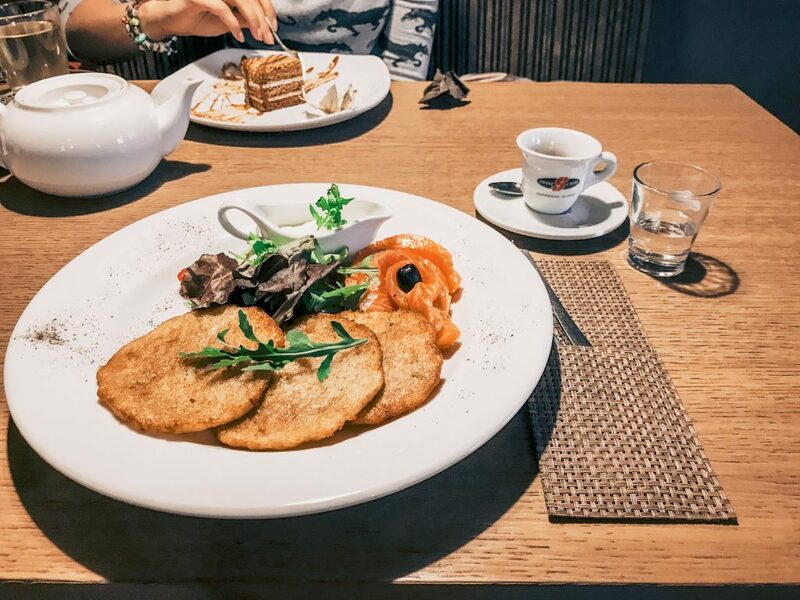 Potato pancakes served with lightly salted salmon – yum! Life isn’t complete without good beer and good coffee. Or, at least, my life isn’t complete. Luckily for me and my beer and coffee loving readers (I know you’re out there), Riga is the perfect destination for you. 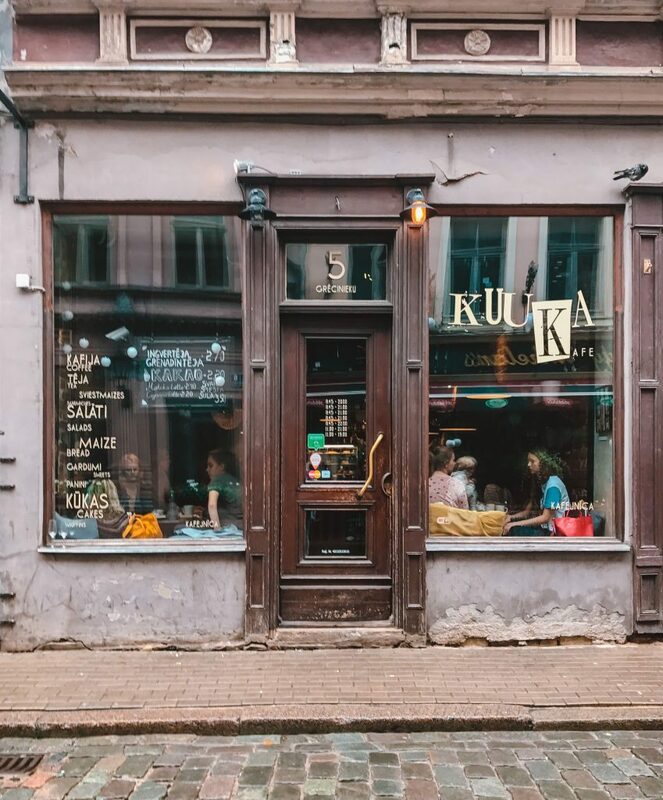 For those preferring to forgo the dairy (whether lactose intolerant, vegan or just wanting to be a little healthier), Kuuka Café was my favourite choice for coffee in Riga, with soy, almond and oat milk options. If you’re perfectly fine with dairy, then they also have a delicious selection of cheesecakes – 10 points for the chocolate orange cheesecake I had on my last day! As with all the Baltic States (and, to be honest, most of Eastern Europe), Riga and Latvia as a whole understands good beer. If you’re interested in the making as well as the drinking of beer, then make sure to visit the Aldaris Beer Museum, which offers beer workshops and brewing courses. Raiskumietis Brewery (try saying that after a few too many drinks) is also a top choice from LiveRiga, where you can visit the brewery and see how they brew both light and dark beers from traditional recipes and, of course, sample the results. If you’re a fan of combining beer and food (I mean, who isn’t? ), Valmiermuiža’s Beer Kitchen is a well-recommended choice. Taking a trip to Riga isn’t going to break the bank. With a coffee in a fairly hipster café costing less than €3 (and, let’s face it, the hipster cafes are always the more expensive ones) and a pint of beer costing around €2, you can caffeinate yourself to your heart’s content and have a decent night out without worrying about spending too much. Riga’s public transport is also inexpensive, meaning you can get to the city centre from the airport by bus (that would be the number 22) for only €1.15. To save myself time heading back to the airport (since I was running late, classic Penelope), I went by taxi using the Taxify app and it cost me a little over €7. For a similar trip in Berlin it would definitely cost me significantly more, probably about three times that! I stayed at Seagulls Garret Hostel, a lovely place conveniently located in the Old Town (and super close to Kuuka Café so I could easily get my caffeine fix). At only €9 per night, you’ll have lots of money left to splurge on food and coffee (my favourite hobbies, of course). If you aren’t the hostel type, then check out these recommendations for the best hotels in the city! Pro Tip: Click here to download the Taxify app and get €7 credit for your next trip! Taxify works not only in Riga, but also in Vienna, Prague, Tallinn, Paris, London, Budapest, Vilnius, Warsaw and many more cities around the globe! You’ll find many cafes and bars in the Old Town – and they won’t break the bank! 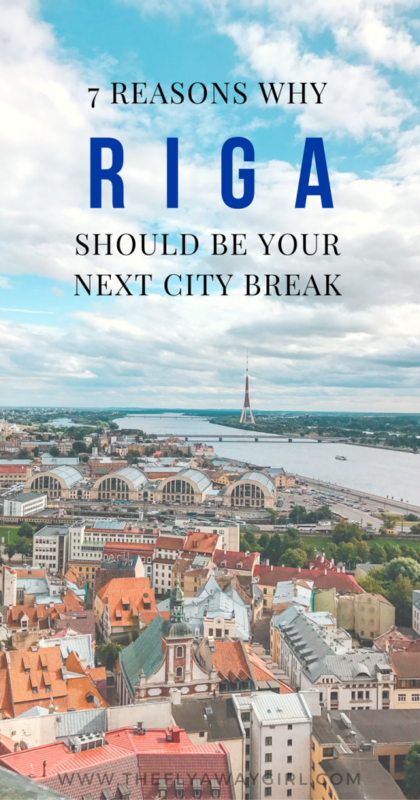 Got more time and don’t just want to stay in Riga? No problem! Riga is only a few hours away from Tallinn and Vilnius, the capitals of Estonia and Lithuania respectively. With LuxExpress, who I travelled with from Vilnius to Warsaw, fares to both Tallinn and Vilnius start at only €5. They also have routes from Riga to Moscow, St. Petersburg, Minsk, Warsaw, Tartu and more. 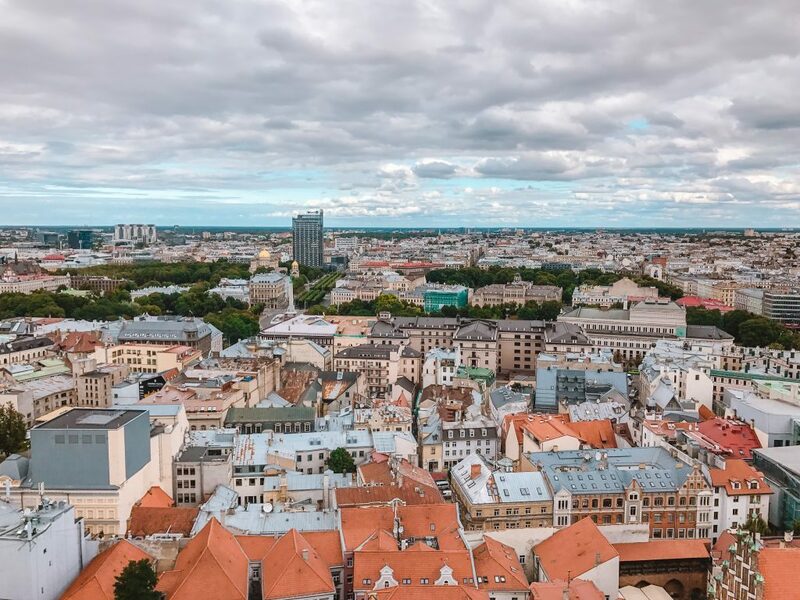 I highly recommend visiting Tallinn and Vilnius if you get the chance – they are definitely two of my favourite cities! 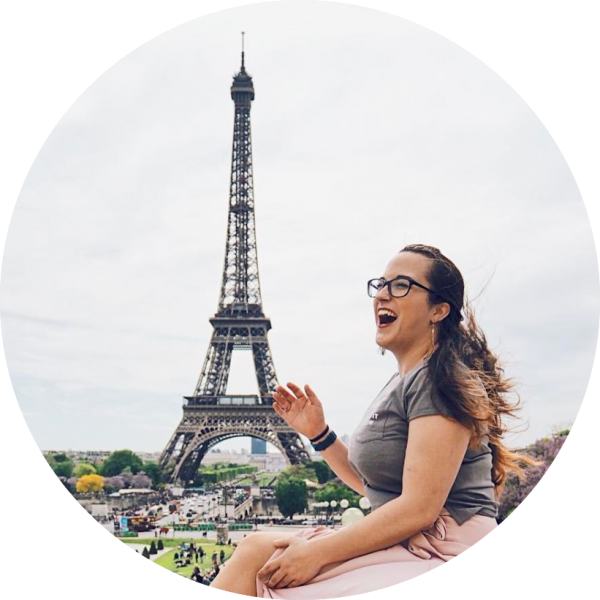 If you decide to head to Moscow, then I recommend that you check out Margherita’s amazing post on what to do in Moscow for first-timers! PS: Don’t forget that you will likely need a visa to visit Russia and Belarus! Only a few countries are exempt, and citizens of the US and UK definitely require visas for both countries. 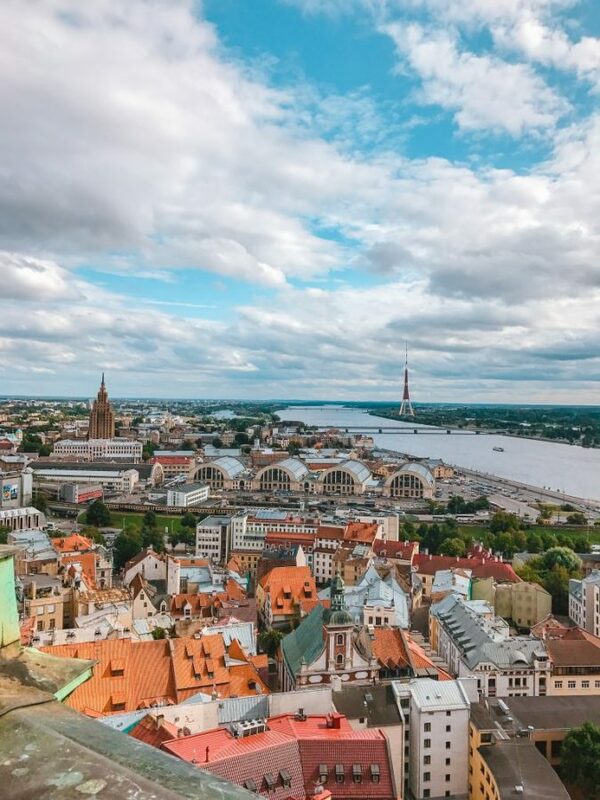 Things to do in Riga include taking the lift to the top of St Peter’s Church to see the amazing views over the city! 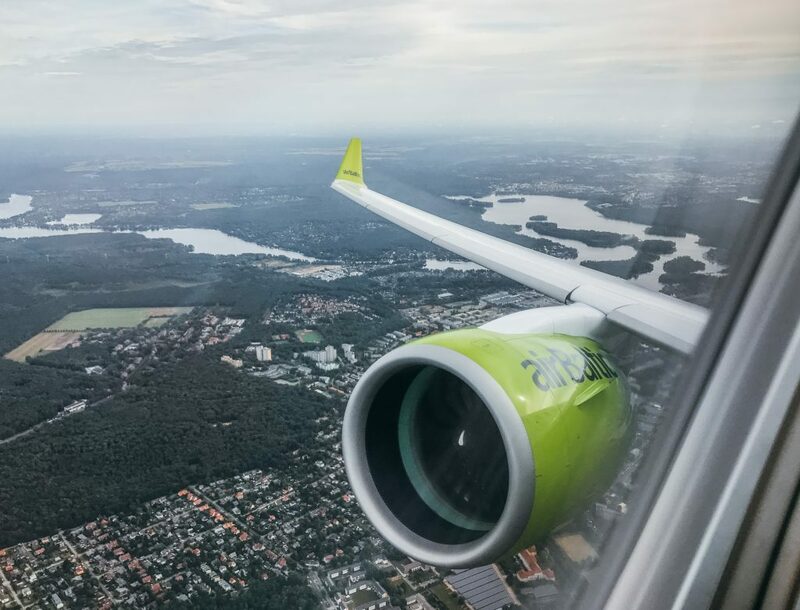 With airBaltic continuously expanding their routes, Riga is easy access to and from many European countries. I flew from Berlin and back to Hamburg myself, and new routes opening in 2018 include Gdansk, Lisbon and Malaga from March, Split from May and Bordeaux from June to add to the already extensive network. If you’re lucky, you’ll also get to fly on one of their new Bombardier CS300s – with more legroom and cabin luggage storage, you’ll be super comfortable! If you are flying business class, you’ll also get to experience their incredible dining options that I mentioned earlier (whichever plane you fly on), which was possibly the best in-flight meal I have ever had… and I’ve had a lot! If these seven reasons haven’t yet convinced you to book your flights to Riga, I don’t know what will! It has been one of my favourite city breaks this year (even though it rained a bit) and I would go back in a heartbeat. Let me know in the comments if you have been to Riga – what did you love about it? I have never heard of this place until now. I like the fact that it’s cheap, has good eats and the buildings look amazing! The cobblestone street looks like it’s a fun place for a stroll, as well. Riga is indeed cool. 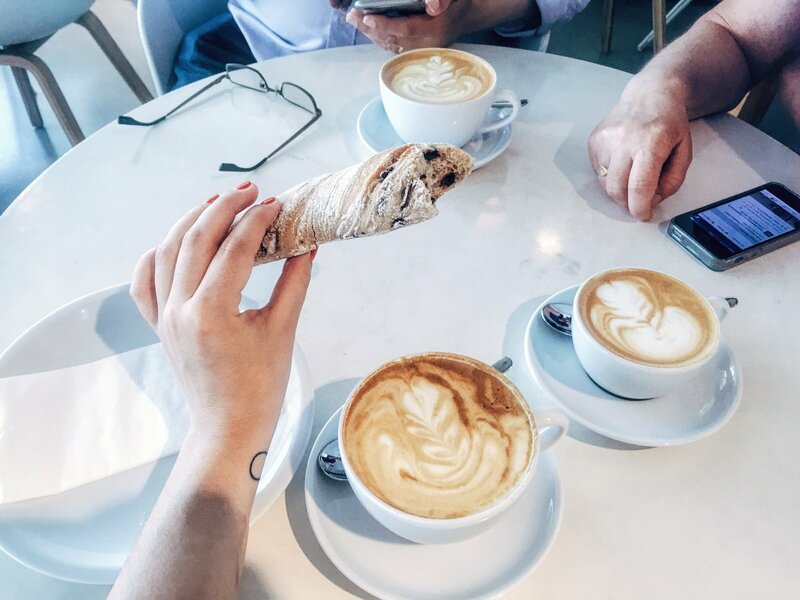 We would definitely head out first to those cobblestone streets and classic cafes. What we love about cities and towns like Riga is that the people are able to preserve their history, culture, and architecture. Unlike other cities where everything is replaced by soulless glass and steel. I absolutely adored Riga! I visited last February and we arrived whilst it was snowing, the whole city looked so pretty under a light dusting of snow 🙂 I was also really impressed with the food there and how cheap everything was. I went with two friends and we had a whole apartment with its own hamman for just over £10 per night each! I usually don’t comment this because it seems such a lame thing to say but SERIOUSLY your photos look good. They are beautiful and make me want to not only go to Riga, but take some photography classes beforehand haha. I’ve never been to Riga and it hasn’t been on my list, but I think I could be missing out. Thanks for sharing! Oh thank you so much!! Feel free to ask me any photography questions too! Man, I had the chance to go to Riga this year, and now I’m bummed I passed up on it! I can’t get over those views! Guess I’ll have to give it a chance another time. Good coffee and beer for cheap plus lots of cool stuff to see? Sounds like Riga has all you can ask for in a city break. This is an area of Europe we haven’t explored yet so it would be a good jumping off point to see the surrounding area like you suggested. Wow! Riga is my love! When I was young, I spent many wonderful days there. Thank you!